Before we start, here is what you need to know about me. Though this is indeed Science on Tap, and though I was indeed invited here by the College of Physicians, I am neither a scientist nor an M.D. I am a food blogger, a folklorist, a historian, and — if anything — a fermentation enthusiast. This means that what I am interested in is people — how people use fermentation, how they have used it in the past, and how it works as a technology that improves quality of life, and the flavor and longevity of whatever it is folks are eating. Don’t forget, folks — this is happening on Monday, April 14, at 6PM. My talk at Science on Tap. 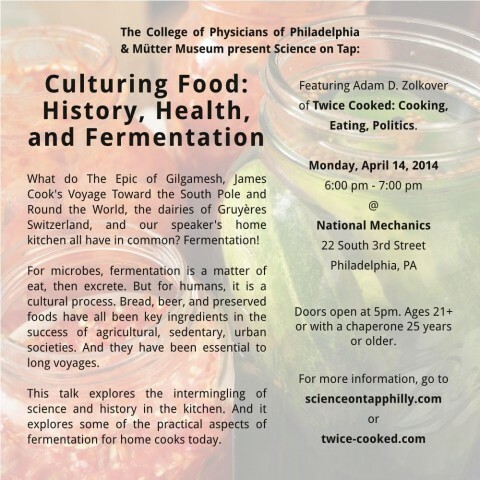 If you’re in Philly, and if you’re around, come on out to the National Mechanics bar on South 3rd St. to hear me talk about fermentation as a science and a technology. There will be pickles! There will be bread! There’s going to be a healthy dose of The Epic of Gilgamesh, and even a little bit of the Bible thrown in for good measure! Anyway: the talk is free. The bar is great. You’ll need to pay for your food and drinks, but National Mechanics does all that stuff super well. If you come by, say hello. I’d love to meet you. I am pleased to announce that — thanks to the generous patronage of The College of Physicians of Philadelphia and Mütter Museum, and thanks to my thoughtful friend Anna — I will be the featured speaker on April 14 at Philadelphia’s Science on Tap.